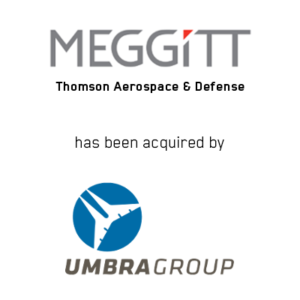 Irvine, CA (March 27, 2018) – Janes Capital Partners is pleased to announce the acquisition of Thomson Aerospace & Defense, a subsidiary of Meggitt PLC (LSE: MGGT) (“Meggitt”), by UmbraGroup S.p.A (“Umbra”). With approximately 200 employees and over 180,000 square feet of manufacturing space in Saginaw, Michigan, Thomson Aerospace & Defense is a leading designer and manufacturer of highly engineered ball screws and a related suite of electromechanical systems serving a broad range of global segments, including civil and military aircraft, helicopters, munitions, nuclear energy and precision healthcare. Founded in 1939, Thomson Aerospace & Defense was previously owned by Danaher Corporation (NYSE: DHR) and sold to Meggitt through the acquisition of Pacific Scientific Aerospace in 2011. Established in 1972 in Foligno, Umbra is a world leader in the manufacture of high-tech actuation components for the aerospace industry. The company’s product portfolio includes recirculating ball screws, bearings, lifting systems, brakes, auxiliary systems and electromechanical actuators. The group employs over 1,000 workers internationally, and the turnover has grown consistently throughout the years, reaching €170 million in 2017. “Umbra is a world class business and we were delighted to advise them on this strategically significant transaction. This acquisition further strengthens Umbra’s position in the US and expands upon its robust product portfolio. We wish the Umbra management team continued success with this new addition,” said Jason Kimball, Vice President of Janes Capital Partners. “This transaction marks another succesful Aerospace and Defense cross-border transaction for our firm, a trend we expect to see continue,” added Ken Fukumoto, Vice President of Janes Capital Partners. Janes Capital Partners and partner firm Oaklins Arietti served as the financial advisors to Umbra. Janes Capital Partners is an independent financial advisory firm that is affiliated with Oaklins International Inc. Oaklins is the world’s most experienced mid-market M&A advisor, with 700 professionals globally and 16 dedicated industry teams in 40 countries.